The weather here hasn't exactly been cooperating. We have had some rain and if you can believe it, freezing rain, and SNOW, BRR. The girls have been exercising, in the Rec room. This kind of weather puts the damper on hiking. Hmm, what to do???? Sounds like a party, not letting the weather get us down the Grimm Trailer hosted a party. Roger cooked a big pot of stew and June made rolls, using a recipe that she got from Roger’s mother. Boy it sure was good, nice hot stew with warm rolls fresh from the oven! 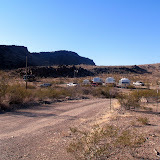 Arriving at Big Bend Motor Inn is like coming to our second home, after all it’s our fourth year and we just love it. But there is work to do, we need to do the obvious, level up, make all the connections, and decorate! Yes, June has a special tree to put up, plant her garden, and rake up the site. We like to spend a day or two to settle in before we go off on adventures. Some of our old friends, Larry, Polly and their two grandkids have been here for a while and decided to hike into Cattail Falls while we settled in. Cattail Falls is one of the areas where the occasional rains drain down from the mountains. We have hiked back into the falls several times and only to see a wet rock cliff. The trail is an old one and is no longer marked on any park map. It is also an area where the Park Service collects drinking water for the park. When Larry and Polly returned and told us that water was flowing over the falls, we got excited, and plans were made to hike out there the next morning. The weather was a little different than when Larry and Polly went in, about 35 degrees cooler. But we all layered up and made the hike in, moving fast to keep warm. We actually heated up enough to shed a layer. As we rounded the bend, where the wash leading up to the falls is, we could hear and see the falls. It was really great to see water coming down over the falls. Even with this water coming down it goes underground a short distance down the wash. It is worth noting that during very heavy rains a lot more water flows down, as was evidenced by trees piled up on big rocks, in the wash down from where it goes underground. The walk out was cool as the wind had picked up and it was sure nice to see the truck. Once we got back June made some hot chocolate for us to warm up, with a splash of Baileys. On January 2nd it was time for June and John to head east, back to Texas. But, we needed to pay a visit to the newly discovered (in cave terms) Kartchner Caverns, in Benson, Arizona. Our tour was scheduled to start at 9:40AM, but we had to be there by 8:40AM, hmm. Anyway the plan was for June and John to take the tour, then head east. So the trailer was made ready, hooked up and pulled out at 7:00AM for the hour and a half trip. This cave was discovered in 1974 by two guys, Tenen and Tufts, who search for caves. It was kept a secret, even from the land owner, Kartchner, as these guys have seen the vandalism that can be done to caves. In 1978 they decided to tell the Kartchners and in 1988 arraignments were made for the State of Arizona to purchase the property and open it to the public. Learning from such caves as Carlsbad Caverns of their mistakes in caring for the caves extra measures were taken to protect this one. A mining company was brought in to dig tunnels into the cave through the rock and install air locks to maintain the natural temperature and humidity in the cave. Special walk ways (wheel chair accessible) were put in designed to be washed down every day and the waste water pumped out. If you want to see a cave in pristine condition, still making formations, complete with bats, this is the one. If you want to see more and get a better look at cave formations, go to Carlsbad Caverns. If you go to Carlsbad, make sure you listen to what they have done to screw it up. Like paving a parking lot over the top of the cave, which stops the flow of water down into the cave, remember, the water dripping makes the various formations over many years.